Here you can find all the technical and dial stickers that you need for your petrol pump jobs. Specific brand stickers (Shell, BP, Esso, etc.) can be found under their brand name in the alphabetical categories. 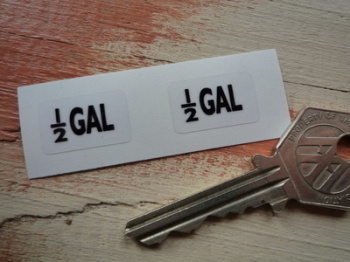 1/2 GAL Black & Clear Petrol Pump Stickers. 20mm Pair. 2 Stroke Shaded Style Cut Text Sticker. 15.75". 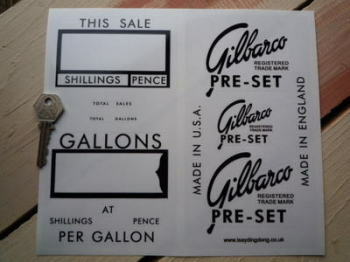 5 Shillings Petrol Pump Sticker. 6". Air Shaded Style Cut Text Sticker. 5.75". Avery Hardoll Black & Clear Oval Stickers. 3" Pair. Avery Hardoll Petrol Pump Clock Face with Hands Sticker. 11". Avery Hardoll Petrol Pump Clock Face without Hands Sticker. 11". Avery Hardoll Petrol Pump Style 2 Gallons Clock Face Sticker. 11". Avery Hardoll Petrol Pump Style 3 Half Gallon Clock Face Sticker. 11". Avery Hardoll Petrol Pump Style 5 Gallons Clock Face Sticker. 18.5". Avery-Hardoll Black on White Stickers. 6" Pair. Avery-Hardoll BOT Notice Blank Petrol Pump Sticker. 85mm. Avery-Hardoll BOT Notice No 1000 Petrol Pump Sticker. 3". 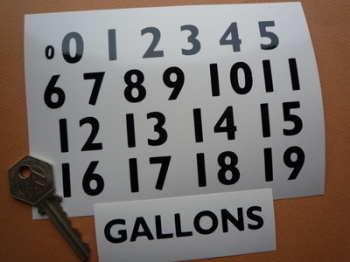 Beckmeter 1/2 Gal & Delivery Commencement Outlined Oblong Stickers. 3". Beckmeter 1/2 Gal & Delivery Commencement Stickers. 3". Beckmeter Black & Clear Text Stickers. 3" Pair. Beckmeter M50 Petrol Pump Clock Face Sticker. 21.5" x 13.5". Beckmeter Petrol Gas Pump Gallons Clock Face Sticker. 11" x 12". Beckmeter Petrol/Gas Pump Gallons Clock Face Sticker. 11" x 13". Bowser Cut Vinyl Petrol Pump Sticker. Various Colours. 5" or 9". Bowser Gauge Printed Dial Face Sticker. 4.5". BP Motor Spirit Cut Text Petrol Pump Sticker. 16". BP Motor Spirit Cut Text Petrol Pump Sticker. 7" or 8". BP Petrol Pump Style Large Sticker. 24". Contains Lead Antiknock Compounds Petrol Pump Sticker. 6". Contains Lead Tetraethyl Petrol Pump Sticker. 6". Contains Lead Tetraethyl Small Petrol Pump Sticker. 4". Derv Shaded Style Cut Text Sticker. 8.5". Diesel Shaded Style Cut Text Petrol Pump Sticker. 12". Gilbarco Petrol/Gas Pump Beauty Kit Stickers Set. Gulf Petrol Pump Style Large Sticker. 24". In Case of Fure Switch Off Here Petrol Pump Sticker. 7". Motor Oil Cut Text Sticker. 22". Motor Oil Cut Text Sticker. 9".